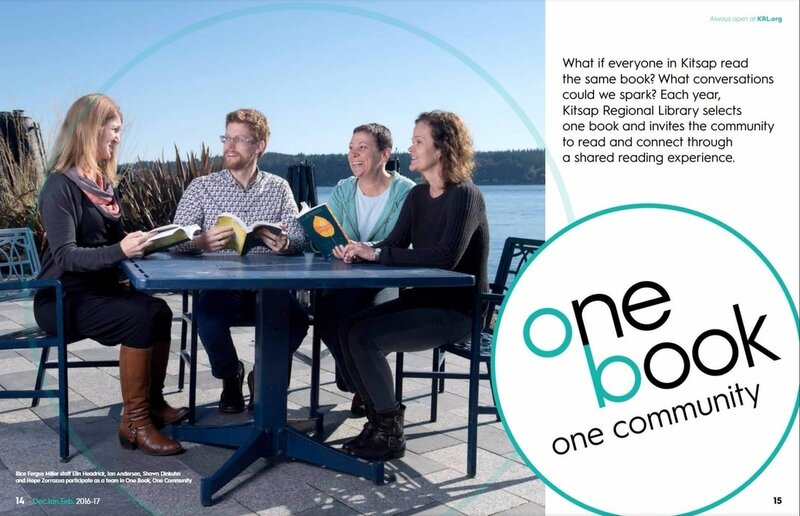 ​Kitsap Regional Library has been building community and sparking conversation with One Book, One Community (OBOC) events for nearly a decade. In 2016, our coordinator for the program retired and I took on leadership of our flagship adult program. 1. OBOC will impact the lives of diverse adult readers by increasing their sense of belonging to a single community. 60% of participants will report having a conversation with a stranger on program evaluation forms by the end of the OBOC month. At least 1 program and 2 outreach events will involve a community partner. Circulation of the OBOC title will exceed previous year by 10%. 2. OBOC will inspire participants to engage with the wider world, encouraging new perspectives and actions. 50% of participants will say they are planning to take an action based on what they read. 60% of participants will say they heard an idea they hadn’t considered or learned something new during the program. Using these outcomes, as well as our organizational values, we revisited the selection criteria we use for the One Book title. We also solicited feedback from all staff on their own and patron experiences, which we continue to do annually to ensure that selection criteria and outcomes stay up to date. Available in paperback, downloadable audiobook, and from the Washington Talking Book and Braille Library. I shrank the size of the committee from 20+ to 5, and ensured that members represented multiple locations, departments, and job descriptions. Instead of meeting for a short period of time just to pick a title, I made the committee a year-round commitment with two year staggered terms. This allowed for a higher quality selection as participants were not rushing to read all the nominated titles and didn't forget about good candidates they read earlier in the year. It also allowed the committee to take more leadership of the program, moving from only selecting the title to also being involved in the design and implementation of staff support materials, public promotions, outreach and partnerships, programs, and evaluation. The resulting team has been able to take on a much more engaged role and accomplish more work in a way that's more inclusive of all staff than the former, much larger, committee. In the second year, we made a major change based on feedback from a frontline staff person. We always purchase giveaway copies of the One Book title for promotional purposes, which we used differently every year. We had just added adults to Summer Learning that year, but did not have the funds for adult prizes (children and teens receive a book upon completion.) She suggested that we tie the two together by making a copy of the One Book, One Community title the prize for adult Summer finishers. This change was revolutionary! In the first year of this connection, adult participation in Summer Learning increased more than anticipated. But even more tellingly, the circulation of our One Book library copies more than doubled, and our average attendance at any individual program increased from 19 to 26. This new connection was clearly encouraging our community to get involved, and to stay engaged throughout the year! Now, instead of participating in several separate programs, our heaviest readers can feel that they are connected to a celebrated community of readers all throughout the year. We look forward to building on the success of both of these programs! Read the 2017 One Book, One Community final report here.